A family member of mine is very persuasive when it comes to getting me to sew for her. She spotted a sequin top much like the one above in a store, and the next thing you know I told her I’d make a sequin top for her. I found this great champagne sequin fabric at Mood ($35/yd, no longer available in this color but we do have blush and steel blue at the NYC store) and stitched up this top over the past weekend when the weather was icky here in NYC. This was the first time I sewed a sequin fabric that wasn’t something I bought in the bargain bin for a Halloween costume. 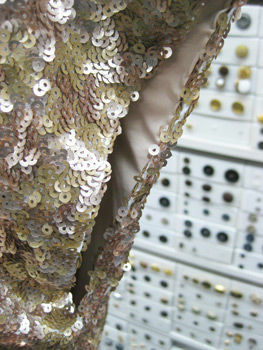 These sequins are dense and the fabric is heavy! I used a sharp 80/12 needle and a pair of old scissors to cut through the sequins. I trimmed the seams to 1/4″ and didn’t bother removing the sequins in the seams, just finger-pressed the seams open. It was actually easier to stitch than I thought it would be. The lightweight spandex lining was stitched to the top at the neckline and then hand-stitched at the sleeves and hem. Pretty easy and way less expensive than the Lanvin inspiration top! And the family member was so appreciative she vacuumed up all the sequins on the floor in my sewing room. You can see the lining here. I LOVE this! What great fabric! And I love that it’s such a simple top paired with an interesting textile. So pretty. What pattern is that? 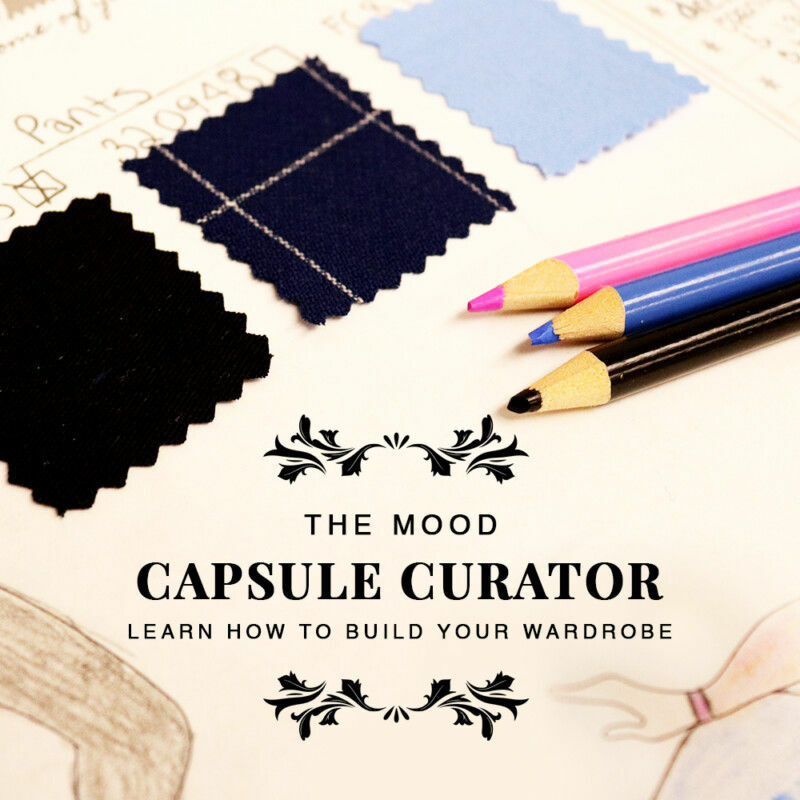 Is there a email address at Mood that I could ask a question and get a recommendation about what fabric to purchase? I emailed from the website and the response was that that email was the warehouse and they referred me to the store. I was unable to reach the store customer service via phone. Rebecca, I modified a Butterick pattern and ended up taking the sides in so much that I didn’t feel I could credit a pattern without being misleading. You could really use any top pattern with a drop shoulder–just leave off the sleeve. You can email me your question at meg [at] moodfabrics dot com. Gorgeous! Plus, your family member saved $365. Amazing! I was so excited to see this sequin top, I made the same comment mulyiple times. Apologize for that……….. This is a very pretty top and I love how the fabric shines in the simple silhouette. Alex generally trades cleaning or organizing in exchange for sewing. Not a bad deal. Of course she’s not exactly near by these days. Great top. I am sure the family member will look stunning in this. What a yummy top! I may have to use my sequin fabric for a top like this. Great idea! Thanks for the info about handling the fabric. I watched the first episode of this year’s season of Project Runway, but my interest has run down. The show’s never really been about sewing, or even design, but about coping with difficult circumstances imposed by others. Maybe I’ll try again later. Oh Meg, that’s great. I’ve been wanting to tackle something like that to wear to a gala in the fall with a Zoran skirt I have. You say any pattern with a drop shoulder. Why is that? Is the idea, the less structure the better? Would putting in sleeves be just impossible? Rita, I was copying a particular top that my daughter wanted, and it had cap sleeves. 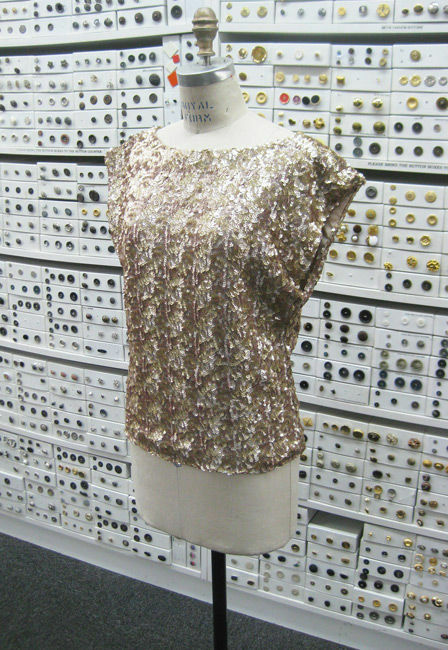 You could certainly make a sequin top with sleeves, as long as they’re simple. Yes, with heavy sequins the less structure the better. There is a pink sequined fabric on your website (described as “tie-dyed”) that looks pretty for something like this. Also I suppose one could make sleeves out of plain silk in a perfectly matching color. Sequin top turned out lovely! Yes I have been watching project runway – I don’t have a favorite yet either, but I’m glad to see they have alot of talented designers with great sewing skills this season. Holy sequins! That top is gorgeous!